Monday was the 16th Annual Martin Luther King Day of Community Service that I organize with my mother and our growing team of planners. It started as a few kids coloring bags for Meals on Wheels in my dining room and has grown into hundreds of people gathering to honor Dr. King through community service. Every year I say it's the best one of ever, but this one really was. 1. We collected: 800 pounds of food, $500 in supermarket gift cards, a carload of pet food for the animal shelter, bags full of coupons for military families and "we forgot to count but so, so many" boxes of tampons, pads and diapers for local families in need. 2. 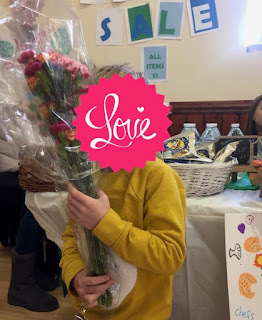 This sweet little 3-year-old came with flowers. 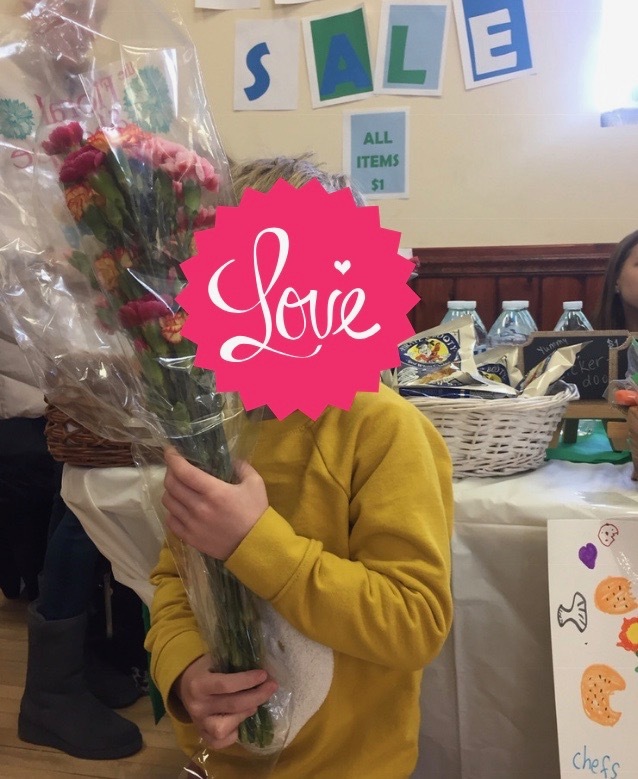 His Mom was buying things from our list to donate and he insisted on flowers. We found someone to give them to who needed some love. 3. We made: original screen printed tee shirts, letters for soldiers, valentines for veterans, care kits for chemo patients, toiletry kits for the homeless, fleece baby blankets as well as new baby care kits for families in need, utensil kits for mobile soup kitchens, toys for shelter animals, fun packs for hospitalized kids, activity kits for home health care patients, bags for Meals on Wheels recipients, drawings for nursing home residents, birthday boxes for kids in foster care. Oh, and plenty of new friends. Birthday Boxes for kids in foster care from Together We Rise: a new activity for us this year that was a big hit. Groundhog Day. How could I have forgotten Groundhog Day? 5. As I said earlier, my Mom co-organizes this event with me. Also participating were: my husband, five children, my mother-in-law, sister-in-law, brother-in-law, best friend and her children, friends I've known since High School, friends I've known for a few years, people I've known from around town for awhile, people I just met recently, friends of friends, people who looked sort of familiar, friends I haven't met yet. At one point on Monday I said, "Oh there's another person I have to go say hello to!" A friend of mine (since High School) heard me and remarked, "Today is sort of like a wedding for you." I love that so much, because it's true. This wonderful, amazing, completely grass roots, so very well-attended day of community service is also a joyful reunion for me. I never could have imagined that after such humble beginnings this is what MLK Day would come to mean for my family and me. My friend saying that it's sort of like a wedding for me might have really made 2019's Day of Service truly the best one ever.